Wow... once again both ladies look terrific. 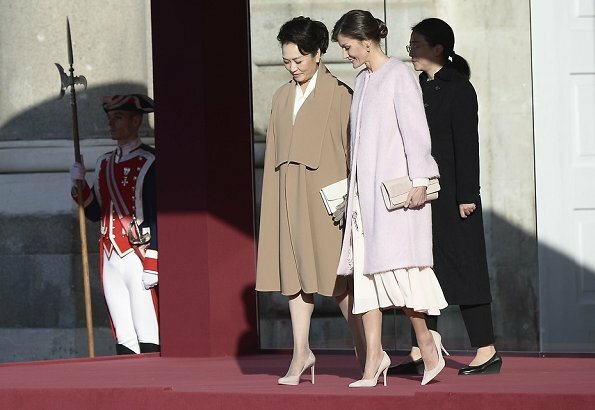 If I were to quibble, I don't like the sheen on Madame Peng's dress, and Queen Letizia's dress seems out of season but perhaps appropriate to the weather, but she looks great in it. Also like her fluffy pale pink coat. Reminds me of cotton candy. Cherry blossoms, tipycal from China, honoring the visitors. Agree, what a wonderful pleasure to see Letzizia and Madame Peng. How stunning is this dress! I just bought it for myself only 119 dls , and she looks absolutely beautiful! Well done, the dress is gorgeous and it shows that you can look ravishing in pieces that don't cost you an arm and a leg. Once again, two very different, but very glamorous outfits. Different styles for different personalities. Beautiful dress. Wish the coat was a little longer but only a small quibble. The two ladies seem to be conversing. Does anyone know what languages they share? I think they both speak english. English! The second language most people learn if they wish to communicate at the international level. 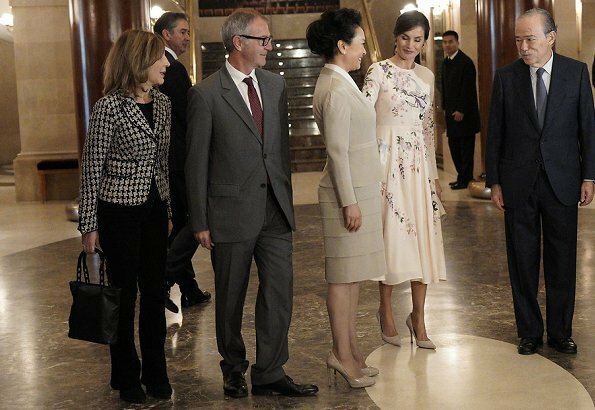 There is an urban legend in Spain that QL does not speak English, but Madame Peng can be seen leaning in to speak only to her without the help of the interpreter...unless she is proficient in Spanish or the queen is proficient in Mandarin. 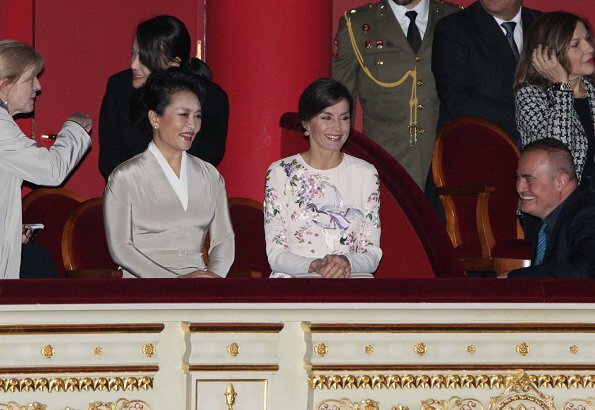 Leonor, the Princess of Asturias is learning Chinesse, maybe parents also. 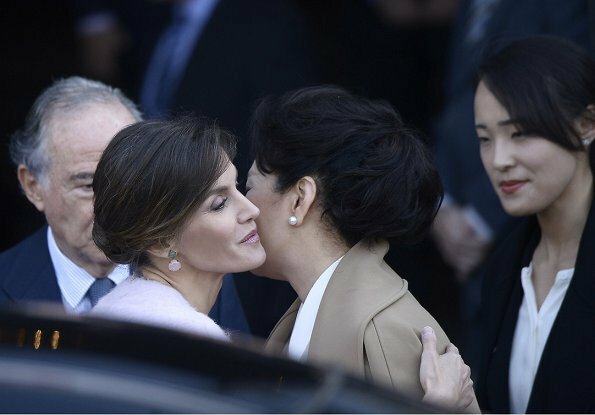 Letizia speaks Enghish and French, and some Portuguesse. Anon 12:07, you made up that legen, almost everybody speaks Enghush nowadays in Spain. Wow both ladies look stunning. Both ladies look great. 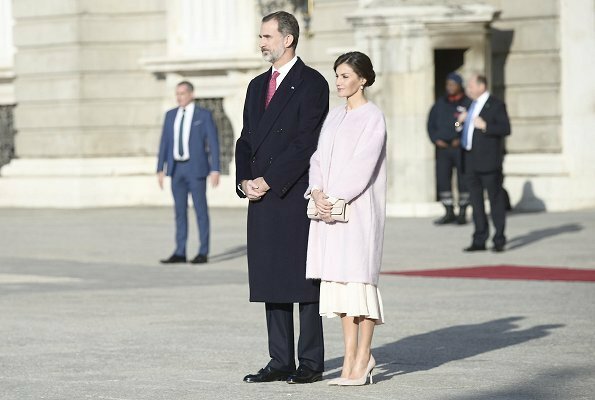 Love the pink coat and Letizia's dress - personally I prefer a longer coat or a shorter coat over dresses that length but it's a minor thing. Wow. I like this very much. Letizia is often a real queen in how she dresses herself. I love the dress, hair, shoes and bag. Personally I wouldn't combine this dress with the fluffy coat. Can't exactly say why, but there is something I do not like. Perhaps because the coat looks like it's for a cold winter day and the dress is more summery. Or the cut... can't put my finger on it. But, having said that, she looks beautiful and regal! Initially I thought "oh, no!--too pale and bland for the Queen" Then I saw the dress on it's own. It's gorgeous and a sensitive choice with the blossom design. I like the coat too but not with this dress--When you have designers to make/adapt clothes for you, I don't understand the point of wearing a too short coat with a longer dress. Women did that at the 50s, when the dresses were longer than now and it was considered elegant. Whach old films!! Queen Letizia is GORGEOUS!! The dress and coat are "to die for"!! I think she's got this "Queen thing" down!! 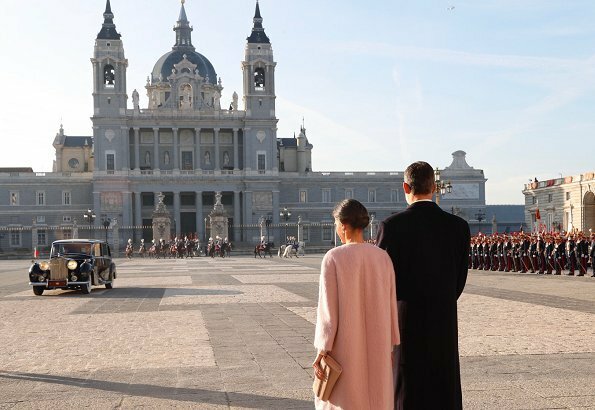 El vestido de Letizia con garzas y flores orientales es delicado, romántico, precioso y los pendientes de jade son un canto a China y sus invitados. Gran acierto. El abrigo rosa 7/8 es tan bonito y mullido que dan ganas de abrazarlo. 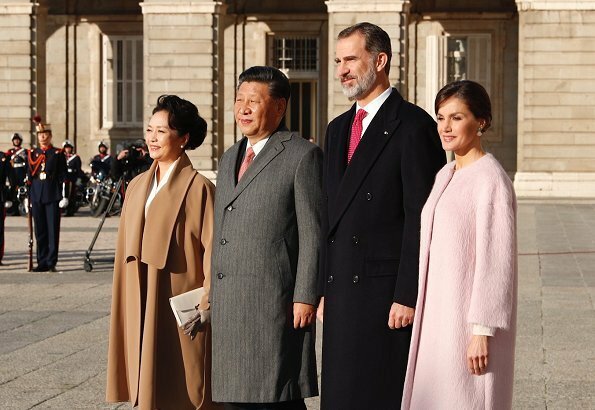 El traje de la Sra Peng es clásico y le queda muy bien, aunque lo encuentro un poco demasiado brillante.